Low 40's - easy pace. I was happy that my groin pull seems to be almost completely healed, but now when I got out of the car today my lower back was killing me. I am getting old... or maybe I am already there... okay I may act 12, but the body... Prayin I wake up with it feeling decent and perfect by the weekend. A solid 28 today... not miles, degrees :) Hope I found a sweet spot for the right amount layers (2) to keep warm without losing mobility. Felt decent - back a little better... I hope hopeful things will come together for Saturday. Busy day of work and tomorrow will be even more so, blah. Getting the blood flowing. In Indy now... legs ready to run. After all the miles of training my focus race finally arrived. We spent the night in Indy and I slept like a log. I was surprised how well I slept since I went to bed earlier than normal, before bed I read and listened to things that inspire or motivate me and honestly I was anxious. It is kinda funny since Angel said there were people down the hall making all kinds of noise in the middle of the night. I vaguely remember hearing some door slam, but that might as well have been a dream. Woke well enough and it was cold. 27 Degrees. Nice. Did I mention I like sarcasm? I packed a few throw away shirts and used them well. The convention center was open so most of us stayed warm until about 15 minutes till the race began. I spent a few minutes in the elite starting area to see if I could see Paul, just to say hello, but nada. He had an amazing race. Somehow I got 3rd level seeding, I guess based on the time I told them I wanted to run. I find that amusing. 1- 7:42 Ok it was cold but being in the large crowd made it not so bad. Good start. 2- 7:40 The big sweat shirt went off as I was starting to sweat. 6- 7:53 My first and only potty break! I was happy I only had one, but this was coming since mile 2 so I needed it!! I am sure someone out there agrees! 7- 7:18 Really I made a mistake. I was trying to make up the lost bathroom time over the next 3 miles, but instead I made it up in less than a mile. I have to learn to control that. 12- 7:21 the coarse was almost all flat, but there were a few minor hills to note. I remember the small down hill here that was nice. 13- 7:29 Some guy was playing 'Hang On Sloopy' and being a Buckeyes fan I was yelling back to him that he was awesome. Good times. Still feeling pretty strong at the half way point. 16- 7:44 When I passed mile 16 we headed into some park area. There was a wooden bridge that was a bit slippery. I was recalling my training, but felt a little tired. I had been using Shot Blocks throughout, but now I reached into the caffeine shot blocks. I had 2 packs of them, more than enough, but was saving them for the end and I felt like I needed a boost soon. 19- 7:26 Me thinks the caffeine is kicking in! Okay I admit, this was one of the other down hills. Some exit ramp. 20- 7:39 I keep chomping blocks, more as a way to keep my mind occupied than actually doing any more good at this point. 21- 7:29 Good mile here, mentally I knew when I hit 20 I wanted to stay sharp. I may have expended a bit more energy, but that was the edge I wanted. I was starting to feel it though. 25- 7:15 An old movie I used to watch was running through my head. The lines went something like "You done everything you came here to do?" "Not yet" So yeah I was digging deep. One neat thing was you were headed right to the center of Indianapolis here and it was beautiful to look upon.... if my legs were not killing me! 26- 6:59 Best mile for the end. I was reaching for anything I had left and it was not much, but I was surprised what the garmin said! I was thanking God and running everything motivation thought through my head I could! .2- 7:00 I could see the kids and camera and threw the hands up at the finish! Total time- 3:19:04 Pace 7:36 Boston Qualified, yeah I am happy. Some of you better go to Boston in 2012, I have to meet some of the people who inspired me. 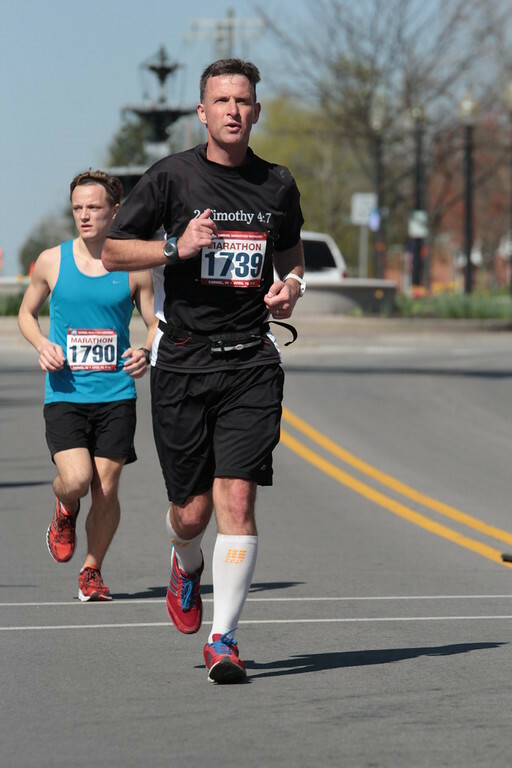 My first marathon just over a year ago was 4:26:35. I will take a 1:07:31 improvement. Thanks to God, thanks to the loving family, thanks to those of you who have honestly motivated me and just helped make the blog enjoyable!! a little better today, still pretty sore... it is nice down here right now. Warm and the countryside is awesome. Recovery runs getting a little faster... legs getting/feeling better throughout the day and just starting to show signs of life while running. I will keep it slow tomorrow but add a few more miles. My friend wants me to run a 5K on the 20th. I am not so sure thats a good idea that soon. Maybe I could pace her, but I do not want to run all out yet. Maybe I am being too strict, I dunno. B-E-A-U-T-I-F-U-L DAY! Its 70 and just awesome out here (back home in Ohio). Nice change after the 27 degrees a week ago. No wonder the kids get sick so fast. Getting there :) Legs feeling pretty decent. I did not do any sprints or anything, but I am feeling stronger again. The weather here is perfect right now, about 50 when I ran... it won't last but it is sure nice while it is here! 26 degrees... hello.... love that Ohio weather change! Crazy I say. Legs are coming along nicely. I have no races coming up so I will be bring my miles back at a nice even pace. A solid 37 today... funny how that is cold somedays and yet after the 20s and cold rain, it felt pretty good. Legs are feeling good, had a nice easy run. Figure I better start adding some miles soon with Thanksgiving coming. We have a HP marathon tomorrow and heading to the midnight showing. Should be fun! We had a good time last night. Highly recommend to anyone who is a fan of the movies and/or books. The kids enjoyed the day and night and even though it was 3am when we got in we thought it was worth it. So after a little sleep in, had a nice run. Legs feel good and I don't even feel tired so thats a plus. Oh I take back that 30's feel warm from the other day. I felt a little cold today, probably from the wind that was kicking up today. Kids are off to 'Granny Camp' this am and we will catch up with them in KY on Wed night and stay through the eating holiday. Cold run this morning and although I worked up a good sweat my legs never really warmed up - so the run was just ok, not bad, but not as lively as I would have hoped for. Let's eat some more. Heat wave! 50 degrees during my early am run, have to love that. Should be about the same tomorrow. Crazy Ohio. My legs felt kinda dead today. Not really sure why, but they certainly were. No worries I guess since I am only doing some aerobic base work for a bit. 24 degrees hours before sunrise - how everyone wants to start a run. I felt good today. I know that seems like a silly statement, but it is the best I have felt running post marathon. Did some strides and legs seem to respond well. I need to get a 5K in soon and really stretch things out. Busy day and work then the drive to KY as we got here about an hour ago. Happy Thanksgiving, there is much to be thankful for! HAHA from 24 to 60 degrees... yep love it. In KY with the fam, all hill (very steep inclines- pushing hard) and trail running, great time. Time to eat and play! +1 PM, had to run that 'hill' one more time... talk about steep! 71 degrees in the afternoon! 39 this morning, so no back to back super warm days, but we were all very thankful for what we had and enjoyed it oh so much! If I always trained here these mountains would either kill me or majorly increase my endurance. They are crazy steep and muddy today - I pushed hard up them, felt the burn in my lungs that us for sure. Sat we spent the day in the car.... ack. Throws off my schedule completely. a solid 19/20 out this morning, easy run. I am tired today. Traveling was one thing, but we had friends from Kenya come home! :) First time they have been back in 3 years so we stayed up pretty late. They will go back to Kenya in June/July. They have already told me I need to visit them and train there for 18 weeks with the locals so they can take me to the next level lol. I plan on visiting, but we will see about the rest! So all things being equal, my run was good today, but I felt sluggish all day afterwards where normally I feel pretty energetic afterwards. Good overall run, ran some strides after 6 miles and finished the last mile HMP.